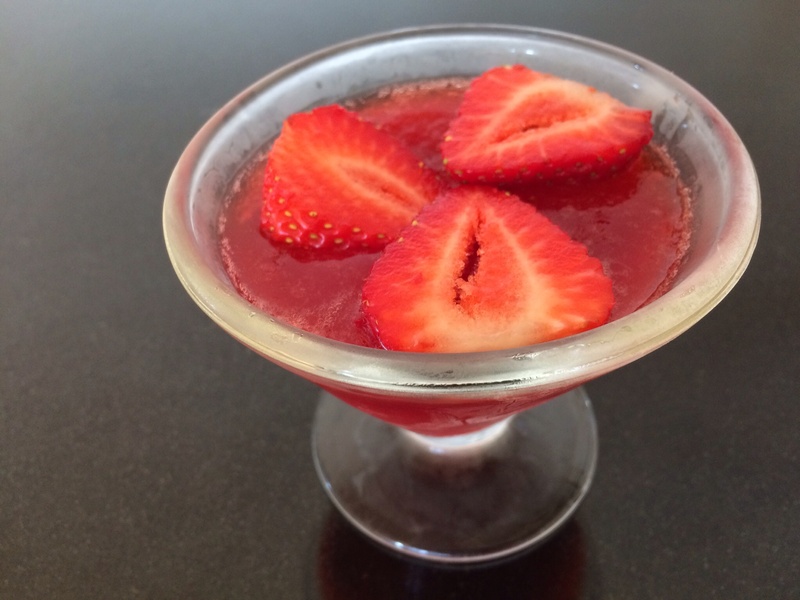 Naturally sweet and fragrant, a light jelly dessert that will refresh you on a hot summer’s evening. 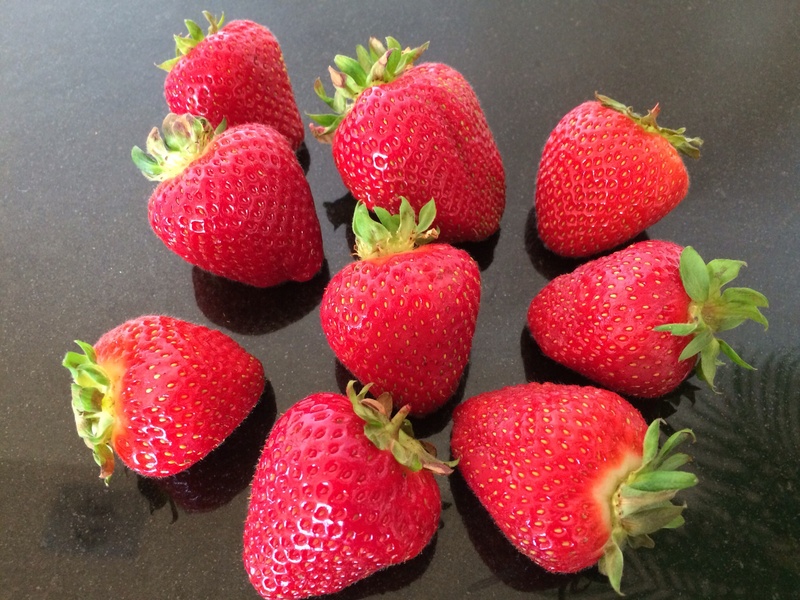 I was eating a few deliciously sweet strawberries for breakfast this morning whilst listening to the radio. There is a lot of talk about sugar today and the necessity to reduce consumption. 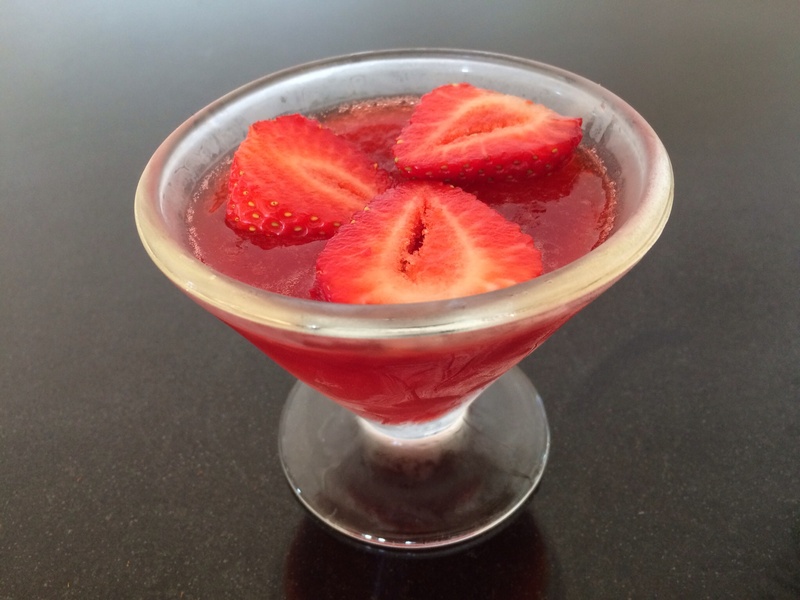 So, having a sweet tooth, I decided to make a naturally sweet jelly with some of the lovely red ripe strawberries to see if it was possible to do so just using the natural sweetness of the fruit and without adding any extra sugar. Obviously the sweetness of the jelly will depend on the sweetness of the fruit so chose well. I’ve used 400g of ripe and sweet strawberries, and 2 sheets of gelatine. This will make enough for 2 people. Wash and hull the strawberries. Cut in half and place in a pan with a tablespoon of water. Place 2 sheets of gelatine in a bowl of cold water. 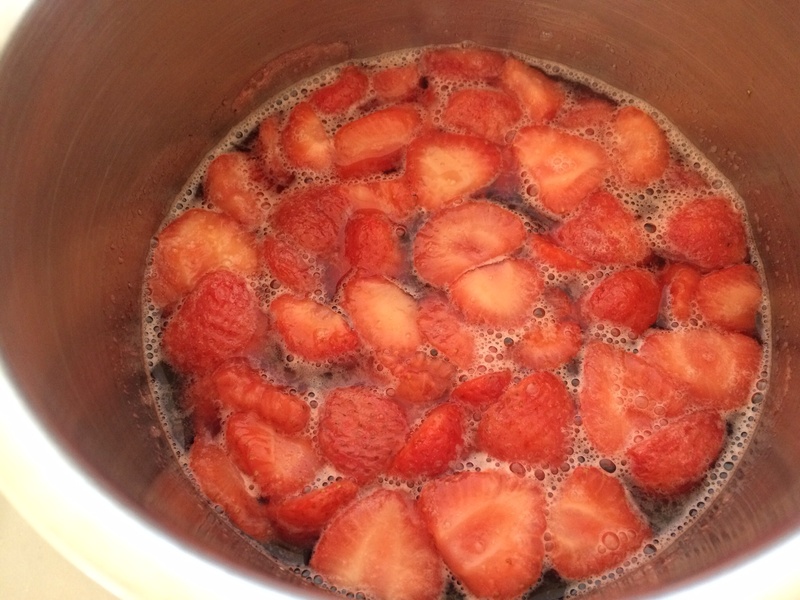 Heat the strawberries for a few minutes until they soften and gently bubble. The kitchen smells divine! Strain them through a sieve into a measuring jug, squeezing the juice from the pulp. It should make up to 500 ml, add a little water if necessary. Put the fruit juice back into the pan and heat gently. Squeeze the gelatine leaves and add them to the pan, stirring until they dissolve. Don’t let the mixture boil. Pour into a couple of pretty glasses and chill for a couple of hours. Serve with some sliced strawberries on the top. I was surprised just how sweet and delicate this was, without the need for additional sugar. Delicious!